Heavenly King, I lay down my life before You, I surrender my all to You. Help me, Oh Loving Father, to break these chains of temptation. Tear down these strongholds that are weakening me. Bind every evil spirit that attempts to lure me into the dark abyss. Ephesians 6:10-11 – Finally, be strong in the Lord and in his mighty power. Put on the full armor of God so that you can take your stand against the devil’s schemes. Hebrews 2:18 – Because he himself suffered when he was tempted, he is able to help those who are being tempted. These evil entities try to control my thoughts daily. I rebuke them, in Jesus’ mighty name! The hand of Lucifer will never fall on me, Oh Lord, for I am covered under Your precious Blood. Lead me, guide me, walk beside me, so that I may not stray or fall by the wayside but if I do, Lord, please pick me up and hold me in Your loving arms. 1 Corinthians 10:13 – The temptations in your life are no different from what others experience. And God is faithful. He will not allow the temptation to be more than you can stand. 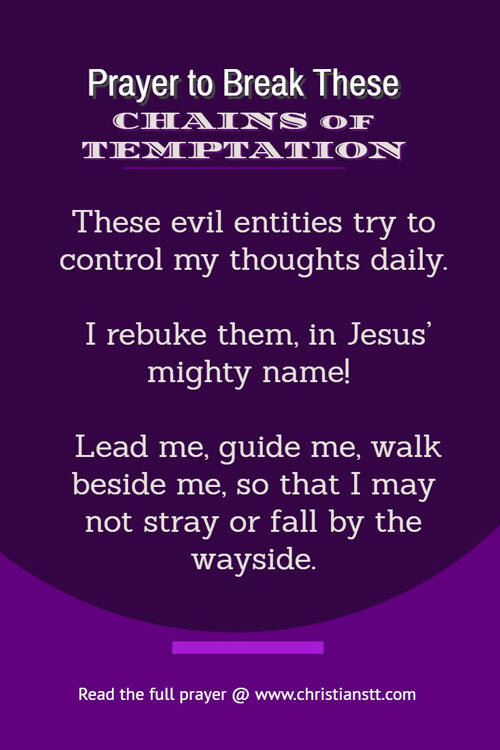 When you are tempted, he will show you a way out so that you can endure. Lord, your loving kindness, and tender mercies are new every morning, therefore I choose to repent now before it is too late. Temptations will not get the better of me because I am a warrior in Your army and the battle is already won. And, as I emerge victorious, as my sins are washed away, I will stand completely engrossed in Your holy presence. For I am forever yours, and you are eternally mine. AMEN! 1 Peter 5:8-11 Be self-controlled and alert. Your enemy the devil prowls around like a roaring lion looking for someone to devour. Resist him, standing firm in the faith, because you know that your brothers throughout the world are undergoing the same kind of sufferings. And the God of all grace, who called you to his eternal glory in Christ, after you have suffered a little while, will himself restore you and make you strong, firm and steadfast. To him be the power for ever and ever. Amen.